Who doesn’t love a family fun party? 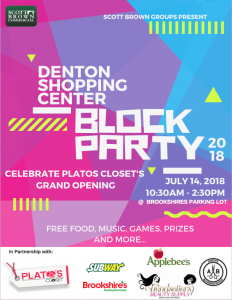 Help us celebrate the grand opening of Plato’s Closet with the very first Denton Shopping Center BLOCK PARTY! Presented to you by Scott Brown Groups and partnering businesses such as Subway, Applebees, Brookshire’s Food & Pharmacy, Trendsetters Beauty Supply, Andy’s Barbershop, Imperial Ale & Spirits, and several more. Join us for the free food, music, and games. Bring the kids out to enjoy the bounce house, foam pit and cotton candy rush while the adults indulge in free wine & liquor tastings, must-have raffles and amazing deals from our participating partners.